Great Britain has had many entertainers, but there was never anyone like Rowan Atkinson's laughable and lovable soul, "Mr. Bean" . . . that is until now! 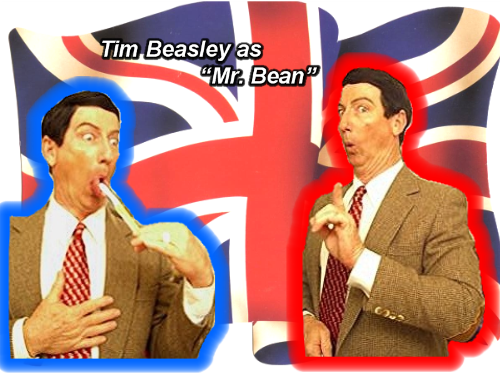 Tim Beasley, a variety celebrity impersonator, is proud to include his zany tribute to "Mr. Bean" in his look alike, sound alike, act alike classic comedy routines. Also popular from the many broadcasts on American "English" TV programs, "Mr. Bean" is recognized by "his" many fans, and Tim always leaves 'em laughing, just like the man himself. Consider Tim as "Mr. Bean" as a fun emcee for a total "British Invasion" show, and he can also return in fine form as "Austin Powers," "John Lennon" and "Tom Jones," too, for a fab fun flashback party event. Your guests are sure to have a "bloody good time!"